FerriShield® suppressors offer the finest performance alternatives by way of universal packaging, specific-purpose and general-purpose formulations. There are a few simple guidelines to assure expected results. 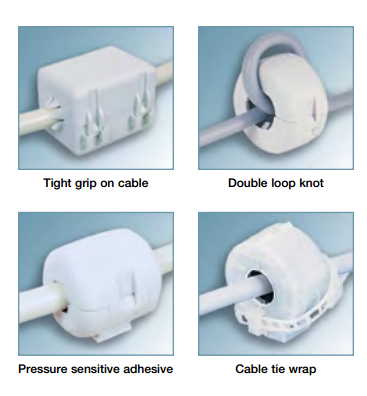 Refer to the chart on the page 33 for maximum recommended cable (or cable bundle) diameter. More than one cable may be inserted through the core opening since each circuit reacts with the ferrite material independently. Consider the double loop knot shown in Attachment section below for snug attachment while greatly increasing the attenuation effect due to the increased magnetic path length. See also page 6, figures 3 and 4 for related technical information. A tight fit between the cable outside dimensions; i.e. O.D., and the ferrite inside dimensions, i.e. I.D., will create the most effective magnetic path and a correspondingly higher attenuation ratio. 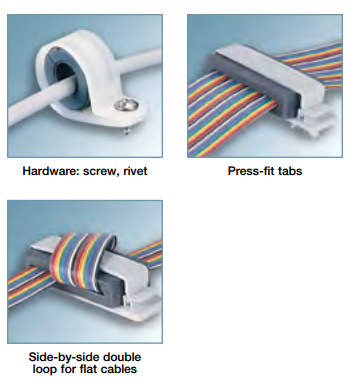 Conversely, a loose fit is acceptable for many reasons, principally if a larger ferrite is desired, or a purpose-fit slack cable for tension control, flexing, etc. The suppressor should normally be located close to the cable termination where it exits the electronic enclosure. Where a cable connects two enclosures containing RF sources, a suppressor on each end may be required. For circuits within an enclosure, a position close to the RF source is best; however, other locations along the circuit may work just as well. This provides the opportunity to allow the suppressor, when affixed to the enclosure, to function also as a cable routing guide. See “Attachment” below for alternatives. Consider the various attachment alternatives shown below.